Drew Barrymore stars as an eight-year-old girl with the amazing ability to start fires with just a glance. Can her power and the love of her father (David Keith) save her from the clandestine government agency, The Shop, that wants her destroyed? From the Stephen King novel. 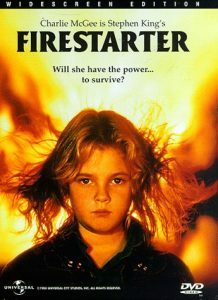 Stephen King wasn’t exactly in peak form when he wrote Firestarter, so this 1984 movie adaptation was at a disadvantage even before the cameras rolled. There were so many King movies being made at the time that this one’s weaknesses became even more apparent. In her first film role after her memorable appearance in E.T., Drew Barrymore stars as a little girl whose parents acquired strange mental powers after participating in a secret government experiment. From this genetic background she has developed the mysterious ability to set anything on fire at will, especially when she’s angry.